The Orbot Vibe has been designed to fit any budget. Save yourself time, money and labor by owning one machine that does it all. 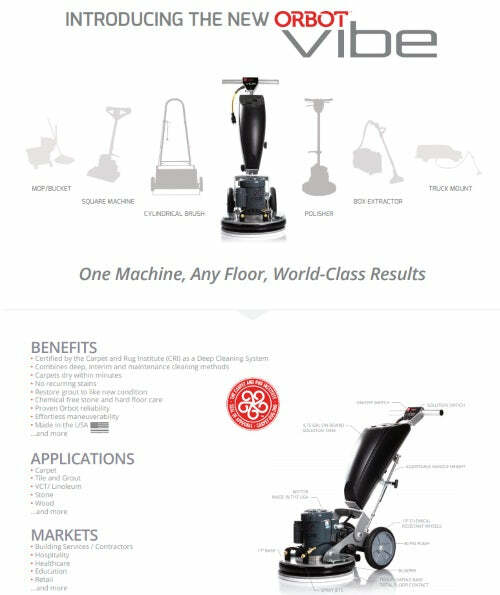 By incorporating our patented dual-action orbital system, the Orbot Vibe generates a powerful form of agitation that delivers superior results in all professional deep and interim cleaning, scrubbing, grinding, stripping, and polishing applications. Easy Flip Base – Base articulates upwards for quick and easy pad changing. Big Wheels – The Orbot Vibe comes with large 10″ wheels for easy transportation. Built in the USA – Orbot is made industry tough 100% in the USA. The Orbot Vibe’s unique, sophisticated design is virtually maintenance-free. So don’t worry, just keep cleaning. Motor – Equipped with a powerful 1 horsepower universal 110V/60 Hz. – 220V/50 Hz. motor that generates 1725 oscillations per minute. Quick Connect Cord – The Orbot Vibe comes with a quick connect cord system for easy cord removal. Thumb-Touch Control Button System – Turns on, off, and sprays right at the tips of your thumbs with its easily accessible controls.